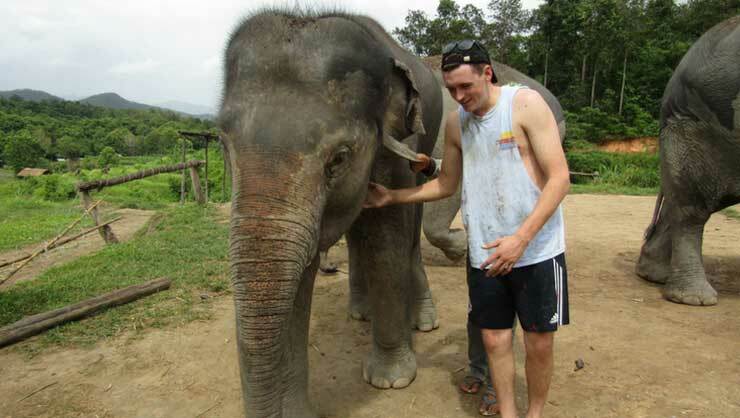 When planning my Teach English Abroad experience in Thailand, I knew I wanted to see elephants. These sensitive, community-driven land mammals are highly intelligent—with three times as many neurons as humans. Little did I know how important it was to choose the right place to visit them. Read on to learn the difference and about an excellent option in Chiang Mai. Many places in Thailand (as well as places in other countries) don’t treat elephants humanely. 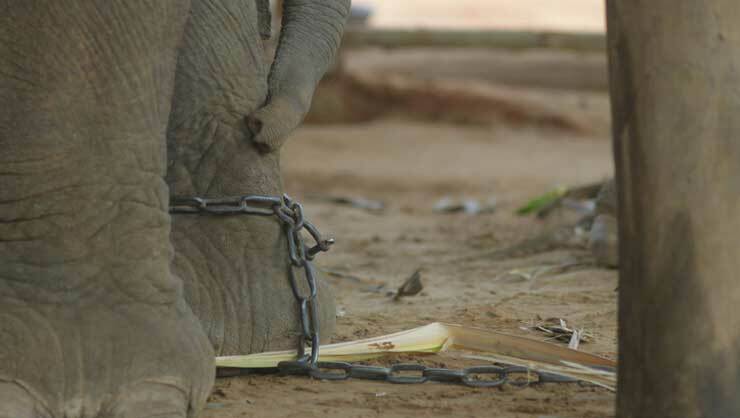 Some places market themselves as “sanctuaries,” yet chain the animals, tie ropes around their necks (causing abrasions and scarring) and even poke them with sharp sticks and spears—all in an effort to train the elephants to follow human orders, including giving rides to tourists. The drive for monetary benefit from tourism leads some handlers to demean, abuse, and overwork elephants. As a result, the animals often develop depression and anxiety. This is not only detrimental to the animal, but can also be dangerous for tourists if the elephant were to have a panic attack or angry outburst in their presence. If you come across any place that allows tourists to ride the elephants, these are the places that have abused them to ensure they are obedient. Avoid places like this, even though they might be cheaper than real sanctuaries. Do your research, visit the company websites and Facebook pages, and be sure to read reviews. While researching, I came across the Elephant Jungle Sanctuary in Chiang Mai, which is a little over an hour north from my school placement in Lampang. Reviewers said the animals are treated with love and respect and they were right! My friend and I made reservations with the Sanctuary via their Facebook page. Easy! A round-trip bus ticket to Chiang Mai (from Lampang) is 140 Thai baht (about USD $4). We booked a room at the Mad Monkey Hostel right in the heart of Chiang Mai. It's only 300 baht a night (about USD $9) and has a pool. The additional 300 baht deposit you pay upfront is refunded when you check out. Hostel/Hotel Pick-Up: The Sanctuary picks you from your hostel at 11:30 am and takes you through beautiful jungle straight to their location, which is only about an hour ride from the city center. Introduction On What to Expect: Once you arrive, they give you a basic introduction on how to feed the elephants and what to expect during the experience. An Endless Supply of Bananas and Bamboo: To feed the elephants for about an hour. Elephant Mud Bathe: After feeding, they take you down to the mud bath area where you can bathe the elephants and rub mud on them, which cools the animals. After about 30 minutes, you’ll head to the river to bathe them and wash the mud off. Photo courtesy of Tim V.
Once the elephants feel they've had enough, they just get up and walk out. That's the beauty of it—the elephants have total autonomy over what they do. Photos: The Elephant Jungle Sanctuary has a photographer taking photos during each phase of the experience. You don’t have to purchase these photos; it’s included in your 1,700 baht fee, and they upload them to their Facebook page where you can access them about a day later. 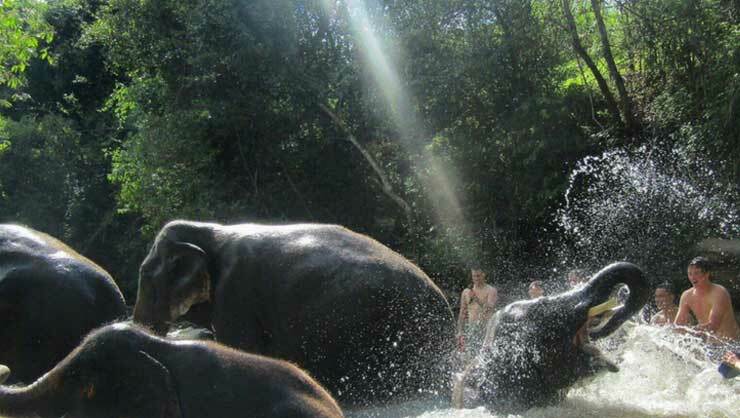 Shower and Feast: Once you’re done bathing the elephants they have outdoor showers for you to wash off. Then you feast on a huge buffet of delicious Thai food and fruits. Transport Back to Your Hostel/Hotel: After the feast, the Sanctuary provides transport back to your lodgings. This was one of the most memorable experiences of my life. 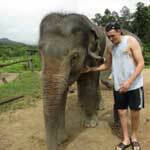 In the two months I’ve been teaching abroad in Thailand I’ve been to the Elephant Jungle Sanctuary twice. It really is that fun! 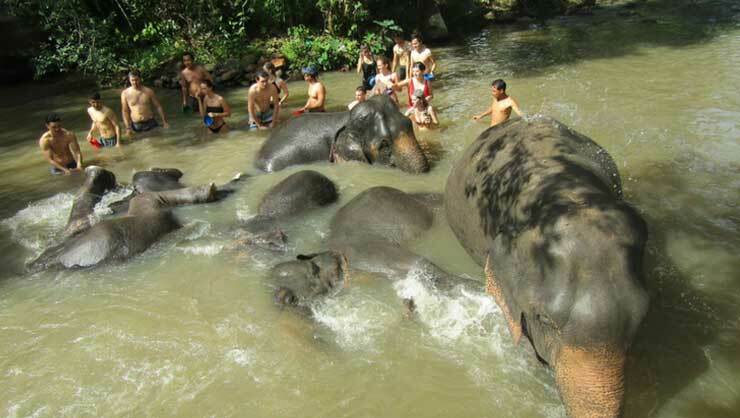 The elephants live and roam freely and truly seem to enjoy the baths and the presence of humans. I would 15/10 recommend visiting this sanctuary, or any humane sanctuary you can find that cares for these animals the way this one has. Tim is a participant on our Teach English Thailand program.